Jordan Brand will be having a treat for their ever-loyal follower next spring as they announced the scheduled release of the first low-cut edition of the Air Jordan 11. A news that was considered as a plain speculation before has now been confirmed after images of its surfaced on the web along with the month of release. 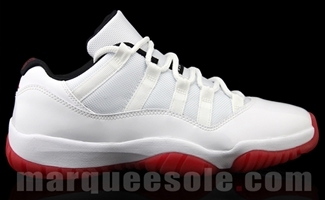 The Air Jordan 11 Low will be released in White/Black-Varsity Red colorway on May 2012, featuring white mesh upper and patent upper part that sits on a red sole. Watch out for this one for it is expected to make a lot of noise once it is released! New Jordan Jeter Cut Available This January! New Colourway Air Jordan 11 Retro Low Now OUT!